(Nanowerk News) The Laboratory of Advanced Materials, belonging to the University of Alicante's department of Inorganic Chemistry, has developed a technology that allows the preparation of artificial methane hydrates. The research has been published by the prestigious scientific journal Nature Communications ("Methane hydrate formation in confined nanospace can surpass nature"). Research has been led by Joaquín Silvestre Albero, Francisco Rodríguez Reinoso and Manuel Martínez Escandell, and carried out by Mirian E. Casco, who is currently completing an internship at the University of Alicante. These researchers have proven it is possible to prepare methane hydrates in a laboratory by imitating, and even enhancing, natural processes through the use of activated carbon materials as nano-reactors. One of the keys of this research was that scientists were able to reduce the process to form methane hydrates, which takes a long time in nature, to just a few minutes, thus making its technological applicability much easier. 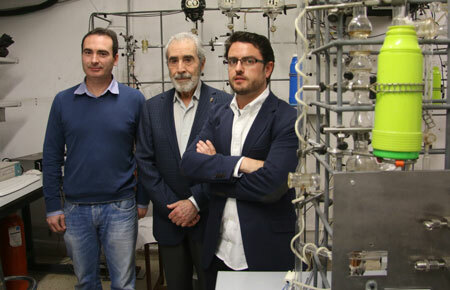 The University of Alicante has been working on the design and synthesis of highly-performing activated carbon for over 30 years. In the words of Joaquín Silvestre, head researcher, "these materials show a great potential to not only eliminate polluting molecules in the air and in industrial waterways, but also to be used as gas storage systems". Manuel Martínez Escandell, Francisco Rodríguez Reinoso and Joaquín Silvestre Albero. These results are a step forward to understanding the artificial synthesis process of these natural structures, and a new pathway into the use of fuels such as natural gas for transport (instead of petrol and diesel), or for long-distance transport of natural gas (e.g. as opposed to current transport conditions, where gas is liquefied at -162ºC, since this new technique allows for gas to be transported at a temperature that is much closer to room temperature). "Our results show that some of our coals can supply amounts as high as 300 methane volumes stored at 100 atmospheres for each volume unit of wet coal", researchers say. Silvestre explains that this research has taken advantage of the so-called "confinement" effect to artificially synthesize methane hydrates inside the coal's cavities or pores. "Methane hydrates have been prepared on activated carbon materials that were previously wetted under gentler pressure and temperature conditions (30 atmospheres and 2ºC) than in a natural environment". Once the synthesis and analysis had been carried out at the University of Alicante's laboratories, the study went on to its final stage in Rutherford Appleton Laboratory in Oxford (United Kingdom), where neutron scattering was performed, and in ALBA synchrotron in Barcelona (Spain). "These studies are the first experimental evidence that it is possible to form methane hydrates in a confined space, with a nature-like stoichiometry and significantly higher kinetics". Other members of LMA international group are Japanese lecturer Katsumi Kaneko, who is collaborating in the development of CONCERT project on the subject matter of this study, and Fernando Rey, from the Instituto de Tecnología Química of Valencia (ITQ-CSIC), who collaborated in the measurements taken in ALBA and Oxford accelerators. Researcher Timmy Ramirez, now a member of US Oak Ridge National Laboratory and former researcher in chief of Oxford's neutron accelerator, has also participated in this research. Gas hydrates (also known as clathrates) are crystalline structures similar to a cage, where a group of molecules surrounds a central molecule of a certain nature. When said cage is made up of water molecules and there is a methane molecule inside the cavity, what we call methane hydrates are formed. Methane hydrates are formed in nature under very specific physical, chemical and geological conditions that can only be found in the bottom of the oceans, or, less frequently, in the subsoil of cold regions such as Siberia, which is known as permafrost. The origin of methane causing these marine hydrates is in the thermal, microbial and bacterial decomposition of organic matter that is dragged by river currents for millions of years. As a consequence, methane hydrates reserves are located in continental slopes, near the shore, approximately 300-500 m underground, where enough organic matter is accumulated and there is the right combination of pressure and temperature. Methane hydrates are the Earth's largest natural gas reserve. They are located near the continental area, and according to the calculations their reserves are double those of all fossil fuels (oil, natural gas and coal) that currently exist on Planet Earth. According to experts, there are 5,000 gigatons of methane, which is approximately 500 times the amount of carbon that is emitted every year from burning coal, oil and natural gas. In 2013, the first exploration to extract methane by de pressurising marine deposits was carried out in Japan. This technology is expected to be available in 2018.